You guys, I need to vent for a minute. I’ve only had two “corporate” jobs, and while they were both very different they did have one thing in common – PEOPLE NOT ACTING LIKE THEY ARE A PROFESSIONAL PERSON IN A WORK ENVIRONMENT! I know there are exceptions to every rule, but really… some of the things I see are just like… what? Really? How are you getting away with that? I try my best to act professional while in the office, and I put together a little list of things that you should probably try to avoid while at work. Inappropriate outfits. If it looks like you could roll straight into the club after you get off work, then maybe that’s not the best corporate attire. I know some offices are super casual, but still. Maybe don’t wear a see-through shirt and a black bra. Just a friendly suggestion. Crying at your desk. It’s just a rule of nature, if you cry at your desk EVERYONE will see you. Sometimes you can’t help it when emotions overtake you and you let a few silent tears out (shoot, I’ve been there- my eyes got very teary yesterday when I was reading an article) but try your best to get to the bathroom. Nobody wants a sobbing lady next to them! Drama. I feel like I shouldn’t even have to list this one, but some grown adults still act like they’re in high school, and it’s just really dumb. This is the workplace! 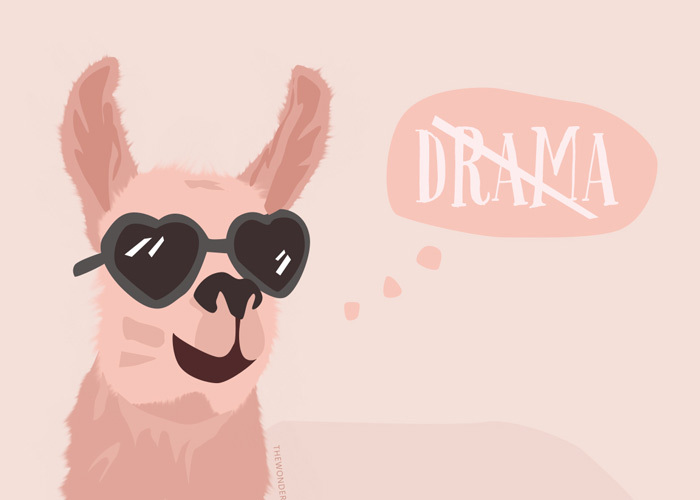 I don’t want drama, please! And if you’re the one causing it/being dramatic, people will negatively associate that with you. Forever. Ok, I feel better now. 🙂 I feel like most of that should be common sense, but hey, everyone likes a good list, ammiright? I’m sure you were picturing any offenders that matched up with an item or two in this list. I know that the office will never be a totally professional place as long as there are humans working, but hey, at least we can hopefully get a few good stories about the people we see while there! « I Can Do Hand Embroidery Now! Why is the intern taking long personal phone calls? Must be an unpaid intern. If so, then, I guess there is no incentive to stop their lives to work. I love the pic of the makeup. Robin Sherbatsky at her finest. Love all the pics, really. Office management are afraid to speak with people, a lot of the time! (SO thankful my new director is upfront with everyone, and stays on top of things. Makes the world of difference.) We have students working in our office, and I have seen underwear from too short skirts SIX TIMES IN LESS THAN TWO MONTHS. How does ANYONE think that is office appropriate?!? UNDERWEAR. Sorry about the shouty-rant- I was so relieved to see that someone else is exasperated…. Couldn’t agree any more with all of this! So true! Love this! I couldn’t agree more!